Starting in the late 1950s and continuing through the 1960s, ‘70s, and ‘80s, clarinetist Pete Fountain and trumpeter Al Hirt were two of the most popular of all New Orleans jazz musicians. Back in 1956 they recorded a classic set for MGM, The Best Of Al Hirt and Pete Fountain, that in 1970 became the first jazz album that I ever owned. It lived up to its title, with Hirt and Fountain heard at the peak of their powers in a sextet that also includes trombonist Bob Havens. 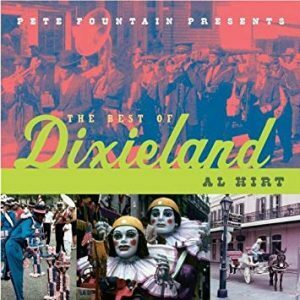 While some of Al Hirt’s recordings from the 1960s were a bit commercial, he shows on this CD that he was a spectacular Dixieland player. As for the more consistent Pete Fountain, he is even better than one expects. Fountain and Hirt light sparks in each other and their memorable meeting resulted in this highly recommended classic. Since 1975 Scott Yanow has been a regular reviewer of albums in many jazz styles. He has written for many jazz and arts magazines, including JazzTimes, Jazziz, Down Beat, Cadence, CODA, and the Los Angeles Jazz Scene, and was the jazz editor for Record Review. He has written an in-depth biography on Dizzy Gillespie for AllMusic.com. He has authored 11 books on jazz, over 800 liner notes for CDs and over 20,000 reviews of jazz recordings. Yanow was a contributor to and co-editor of the third edition of the All Music Guide to Jazz. He continues to write for Downbeat, Jazziz, the Los Angeles Jazz Scene, the Jazz Rag and Jazz Inside.